Just Updated with New Video! Experienced drummers are always saying that the groove is the main thing. That’s true. Having a great feel when you play beats is non-negotiable, but you still have to be able to play some cool fills when the time is right. One of the most common questions I get from beginners is “can you show me some drum fills?” Of course, I’m always happy to oblige. 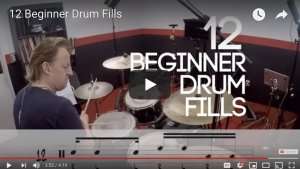 And that is the topic of this post: drum fills for beginners. Here are 12 simple drum fills. Nothing fancy. Just a dozen reliable fills that will work in many situations. They are all based on eighth and/or sixteenth notes and they are all just two beats long. They are also all just hands only. No hand/foot combinations here. These fills are all about taking simple rhythms and placing them on different drums with confidence. And they sound pretty good. There’s a video for you to check out so you know how the fills should sound. Below the video is a link with a PDF so you can download and print out a sheet with all the fills written out note-for-note. Why don’t you give these a try? Work on these fills and let me know what you think.